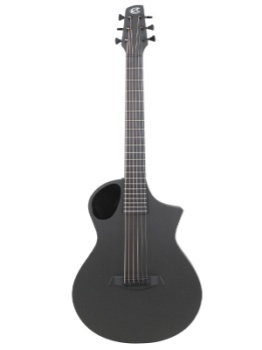 All Composite Acoustically Tailored™ construction for ultimate tone, durability and versatility. 14 fret to the body Carbon fiber neck for consistent playability (no truss rod adjustments needed, EVER!). Proprietary carbon fiber bridge and saddle materials for maximum sound transfer. Rigid one-piece neck/body construction for long-term stability. Impervious to climate for consistent performance, wherever you go. Equipped with the L.R. Baggs Active Element pickup system. Ultra-Precise tuning machines with 18:1 ratio. Handcrafted in the USA by skilled technicians and craftsmen. Proprietary Reinforced Polymer Fretboard with 21 medium stainless steel frets, top dots & side dots. Ships with Elixr® Nanoweb® strings, .012-.053. Offset sound hole with integrated top bracing technology™ (IBT™).